Oil and caustic soda are the raw materials to produce laundry soaps and toilet soaps. There are four key steps to produce soaps: oil melting, saponifying, vacuum drying and forming. The main machines are saponification cauldron, vacuum dryer, heating exchanger, fine separator, barometric condenser, soap noodle pellitizer, three-roller mill, vacuum plodder, cutting machine and so on. Automated assembly line – Simple operation, fewer labors. Only the feeding, power distribution and the soap-collection need manually operation. High working efficiency – The capacity of the line is 1-3 ton/hr. Control soap’s quality conveniently and effectively – The vacuum drying system can control the fatty acid content(active ingredient) of soaps or soap noodles, thereby to control the product’s quality and cost consumption. 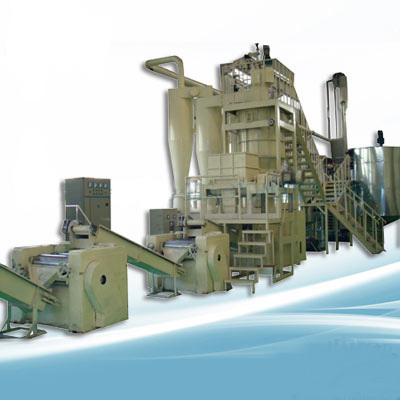 Various products – This production line can produce many sizes high-quality laundry soap, function soaps, antibacterial soaps, medicated soaps etc. The soap is not easy to crack, the shape of soap is neat and square, the appearance is fine and smooth, the logo is clear and beautiful. Capacity: 1000-1500 kg/hr, 2000-2500 kg/hr, 3000-3500 kg/hr. Mark & model : Features of soap plant with oil as material: Advanced technique of saponification, vacuum drying and continuous plodding and stamping is adopted; production efficiency high, workshop area little, product consumption low, staff required few, quality of end soaps stable; various kinds of laundry and toilet soaps can be produced; smooth and no crack surface; elegant logo stamping; many kinds of soaps can be produced from this same line, such as different grades of toilet soaps, hotel soaps etc.